Want to be notified of new releases in digitalcraftsman/hugo-alabaster-theme? A documentation theme ported from Sphinx to Hugo. 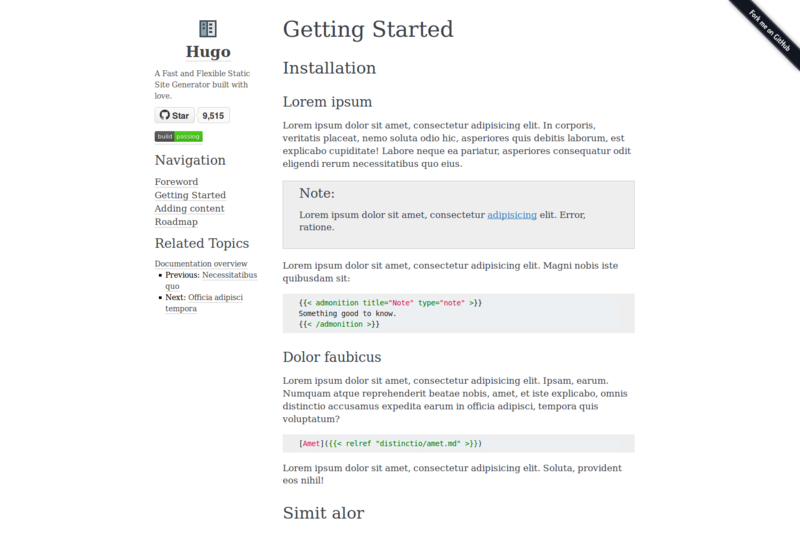 This theme uses the latest developement version of Hugo. Therefore, it doesn't work with the official releases. Look here if you want to know how to build Hugo from source. Next, take a look in the exampleSite folder at. This directory contains an example config file and the content for the demo. It serves as an example setup for your documentation. Now you can go to localhost:1313 and the Alabaster theme should be visible. For detailed installation instructions visit the demo. Last but not I want to give a big shout-out to Jeff Forcier, Kenneth Reitz and Armin Ronacher. Their work and modifications on the original codebase made this port possible. Furthermore, thanks to Steve Francia for creating Hugo and the awesome community around the project. The theme is released under the BSD license. Read the license for more information.